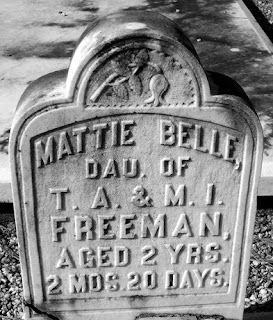 Nearby rests the little daughter of Mr. and Mrs. Freeman, Mattie Belle. She was but 2 Yrs. 2 Mos. 20 Days. Inscribed on the back of her stone is this: "She was but a jewel lent us, To sparkle in our midst awhile. Then God called and took His treasure, Before she knew an earthly guile."